I saw us moving as one body. We sat around chatting, eating, and laughing. We did all the chores in the house. We prepared the house for the upcoming Idul Fitri. And practically nobody told anybody else what to do. We just did it. Of course we conversed about what needed to be done, but nobody told anybody to do anything. It was like we knew our place and we knew what was asked of us. And if I, for instance, could not do something, I knew whom I needed to ask. On Idul Fitri eve, the house was all prepared to receive guests for the following days. 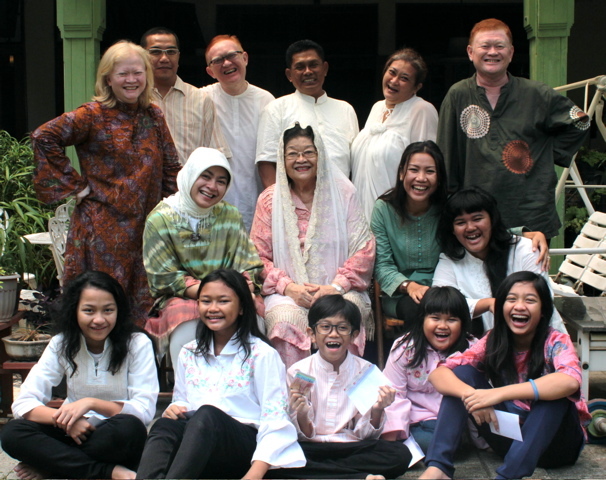 My mom is one of the eldest among our relatives in Jakarta, so quite a number of relatives visit our house. As the guests arrived, we took turn (automatically) in serving the guests, accompanying them, cleaning up, or simply taking it easy and laying about the sofa. It was such a wonderful experience: when we, people, move as one body because of Love. We follow ‘whatever feels right’. The heart takes over. Everything is just so natural, so comfortable, and so easy to be with. The bond of love among us, though hardly ever spoken in explicit words, is just so strong. And that was all it needs to move us. There were times during these last two-three days when I briefly stopped only to witness, enjoy, breathe in, with a smile, what was going on around me, and in my heart. How beautiful. How blessed. Maybe God is showing me what “return to purity” tastes like. (That’s what Idul Fitri means, a return to purity). As we return to our pure state, what we truly are, and we stay true and loyal to it, we bow to it, we follow it, then everything would flow naturally from there. All we need to do is surrender, follow what is in our heart and allow ourselves to be carried by the flow of things to be. And what do you know, He uses this beautiful, unusual bunch of people to show me this. People who have been with me throughout my life. People who completely accept me as I am, and I them. Just like, well, God. Beauty. Ease. Love. Guidance. Heart. Surrender. Listen. Follow. You’ve got the gist. Ied Mubarrak. Apology for all the mistakes made. May we be among those who return to our pure state as human being, to become blessings for the whole universe. My regards to your family. PS: I kept thinking “my family may not be perfect but ..”, but then again, perhaps we are perfect. Because He is Perfect. 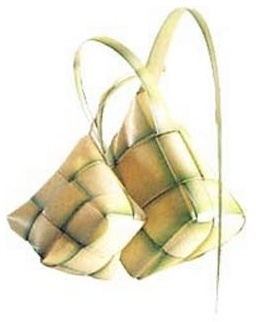 Ketupat picture taken from here.